American Sniper is Clint Eastwood's war film about real life Navy SEAL Chris Kyle (played by Bradley Cooper), a figure who has recently stirred up controversy responding primarily to his 160+ confirmed kills. To some, he's a patriot; to others, a murderer. But there's a more important question to be asked first: does the film endorse him? He's built from a problematic blend of violent machismo and egotistical patriotism, and many viewers have come away from the film disliking him. But just like last year's Wolf of Wall Street, rejecting the film based on an aversion to its protagonist misses the point. There are plenty of problems with American Sniper, but the controversial way it presents Chris Kyle is not one of them. For me, that's its greatest strength. The film frames Kyle as a symbol of American ideology at its best and its worst and asks us to judge for ourselves whether our safety is worth the bloodshed (he is indirectly compared to Paul from the Book of Acts, "stand[ing] in judgment for what he believes"). We're introduced to him in a scene where he must decide whether or not to shoot a young Iraqi boy, with his commanding officer telling him it's "his call". This lays the groundwork for a cinematic discussion which is concerned first and foremost with the ethics of Kyle's decisions. From there, the film develops his character as the prime subject of American ideology. In a flashback, he watches the September 11th attacks on television and is consumed by a desire for retaliation rather than for knowledge of what provoked the attack. More than once he has others point out how his dedication is rooted in a narcissistic messiah complex—he acts out of a benevolent need to help others, but he also believes that he's the one to do so—but this never makes him stop and think about what he's doing. He's a man who exists only to serve his country. In his childhood, Kyle's father makes a distinction between sheep, wolves, and sheepdogs, which leaves him on a troublesome moral high ground which justifies immoral acts of violence under the guise of protecting (shepherding) the innocent. He's the typical schoolyard bully who gets away with finishing fights because he "didn't start it." He wants to be Captain America, but he is the altruism of Shield and the wrath of Hydra embodied in the same person. For all his rage, severity, and arrogance, he is also selfless, loyal, and dedicated. He is America, and throughout the film he stands in judgment. 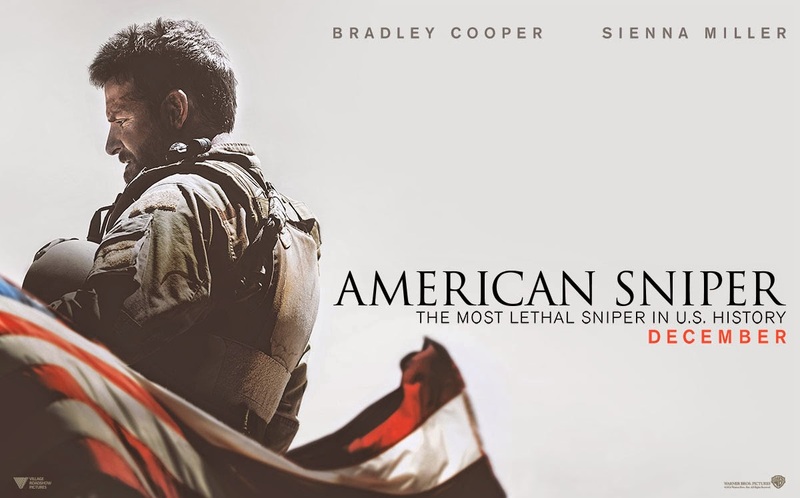 With the help of Bradley Cooper's excellent performance, American Sniper succeeds marvelously as a character study; its problems lie elsewhere, and the biggest one is its lack of focus. Whenever the story strays from Kyle it quickly begins to fall apart. Sienna Miller is given nothing to do as Taya, a stereotypical housewife capable of little more than crying when her husband's away and complaining when he returns (frustrating enough in itself, but made worse by the fact that they spend all of 5 minutes together before getting married). Hollywood is constantly plagued by poorly written romance being shoehorned into everything, and every time Kyle comes home the movie starts flatlining. 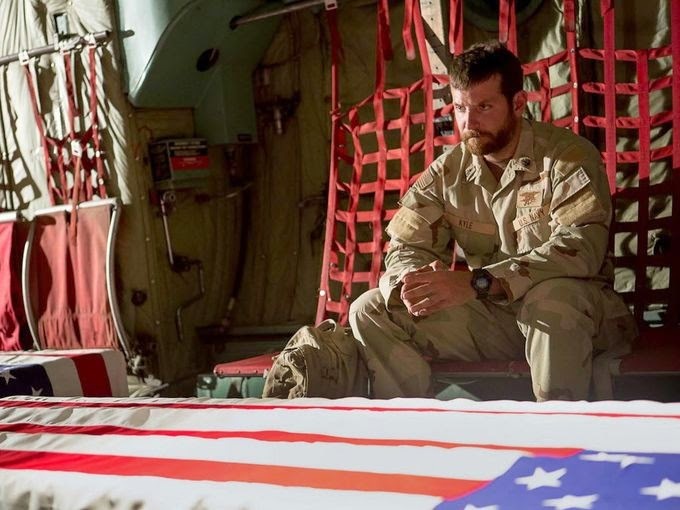 American Sniper also feels like two very different movies crammed together. Steven Spielberg was originally on board to direct before Clint Eastwood took over, and the remnants of his vision for the film occasionally poke their head up through the cracks in the finished product. Spielberg wanted it to be about two competing snipers (whereas Eastwood's vision is more general, pitting Kyle against a faceless foe), and while the character of the Iraqi gunman is still in the film, his role was significantly reduced. As a result, there are a few moments that feel like they were never fixed during rewrites (Taya asks Kyle "is it him?" even though "he" has never come up in conversation before). The two movies vie for dominance, and the result is an inconsistent experience. In technical terms it's a fairly proficient film, although its six Oscar nominations feel a bit excessive. Eastwood has a very dry and humorless sense of style (the shadows of Unforgiven haunt the image), but what the film lacks in action it makes up for in tension and character development (it's more Hurt Locker than Black Hawk Down). Its greatest strength outside Cooper's performance is its editing, using cuts to take Kyle out of his tours without warning and place him suddenly back with his family, forcing the audience to try to find their footing the same way he is. 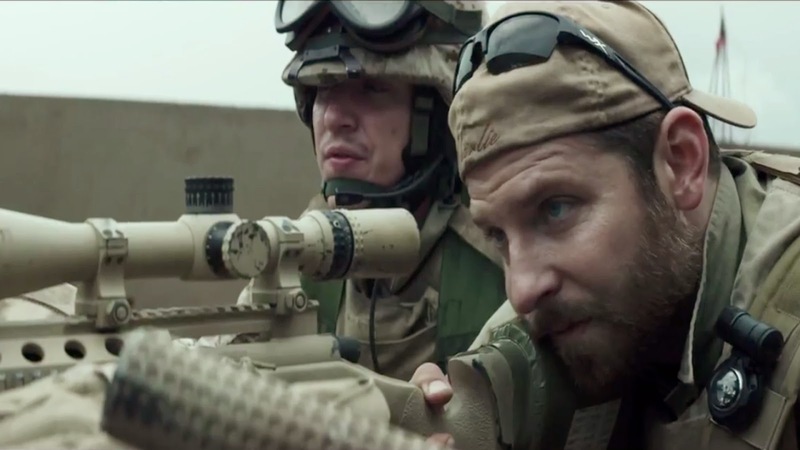 Like its protagonist, American Sniper is a conflicted and controversial film. Whether you love him or hate him, many will be unable to see past Chris Kyle to the rather unexceptional war film underneath. But while the bleak, dull melancholy tested my patience at times, ultimately I found Bradley Cooper's examination fascinating enough to make it worthwhile.